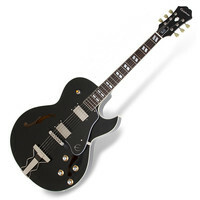 The Epiphone ES-175 Premium is a faithful reissue of one of the most famous archtops from jazz and rock classics. The ES-175 Premium features Gibson USA 57 Classic pickups and vintage-inspired “aged” Lacquer finish that will make you think youre playing a 50s original but at a price anyone can afford. This stylish hollowbody guitar has an Ebony finish Laminated Maple top 22-fret Rosewood fingerboard with parallelogram inlays and a black pickguard with white binding.